Definition • Sec 2(d) -Consideration is the price or something which one party pays to buy the promise or the act of the other. It can take the form of money, physical objects, services, promised actions, or even abstinence from a future action. - Promisee must give something in return for the promise made by the promisor). - For example, a person enters a shop and agrees to buy a second-hand car for RM 10, 000. A contract has been made. The buyer’s consideration is the promise to pay RM 10, 000. The shop-owner’s consideration is its promise to pass ownership of the car to the buyer. - it can take the form of money, physical objects, services, promised actions, or even abstinence from a future action. 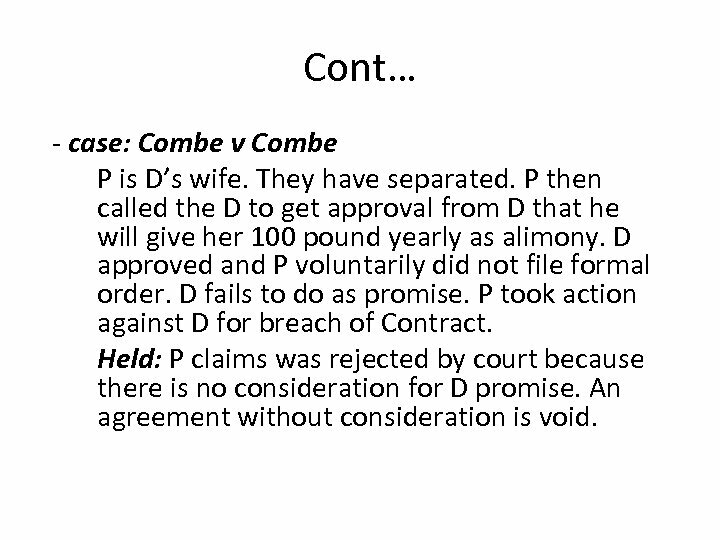 Cont… - case: Combe v Combe P is D’s wife. They have separated. P then called the D to get approval from D that he will give her 100 pound yearly as alimony. D approved and P voluntarily did not file formal order. D fails to do as promise. P took action against D for breach of Contract. Held: P claims was rejected by court because there is no consideration for D promise. An agreement without consideration is void. 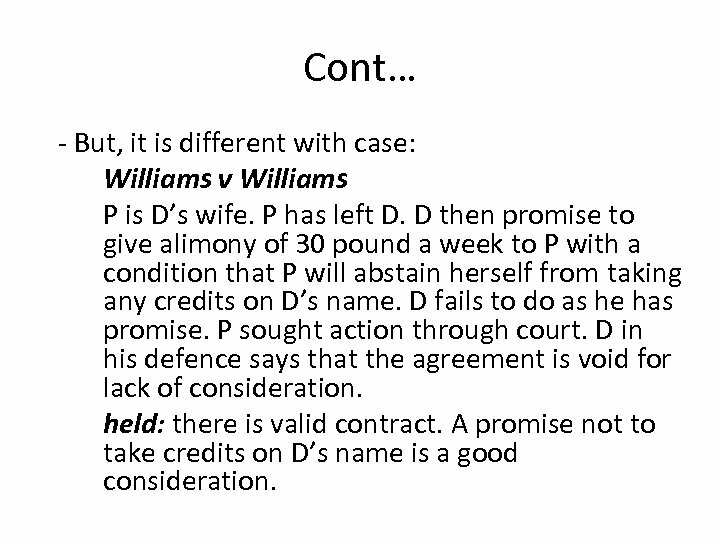 Cont… - But, it is different with case: Williams v Williams P is D’s wife. P has left D. D then promise to give alimony of 30 pound a week to P with a condition that P will abstain herself from taking any credits on D’s name. D fails to do as he has promise. P sought action through court. D in his defence says that the agreement is void for lack of consideration. held: there is valid contract. A promise not to take credits on D’s name is a good consideration. Categories of consideration • Executory - where the parties exchange promises to perform acts in the future. 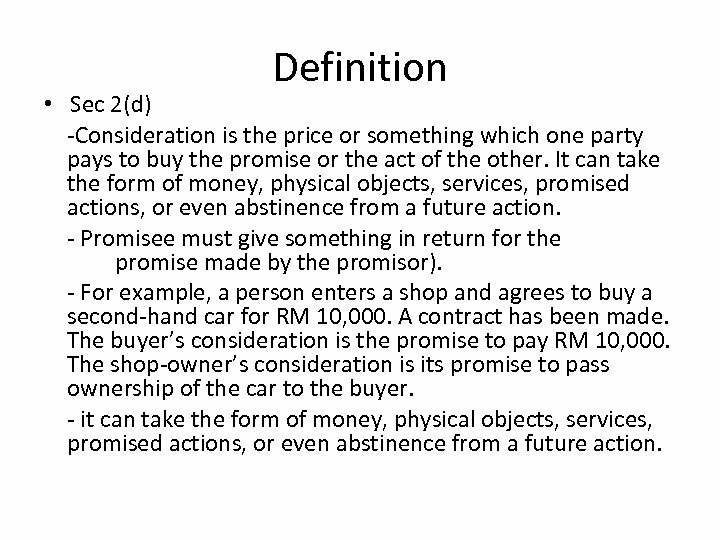 - E. g: C promises to deliver to D a bicycle and D promises to pay RM 100 for the bicycle. • Executed where an act is done in return for the performance of an act. (reward situation). - E. g: Laila lost her wallet. She offers a reward of RM 100 for anyone who found her wallet and returns her wallet. Majnun found her wallet and returns it to her. She paid the reward of RM 100 to him. 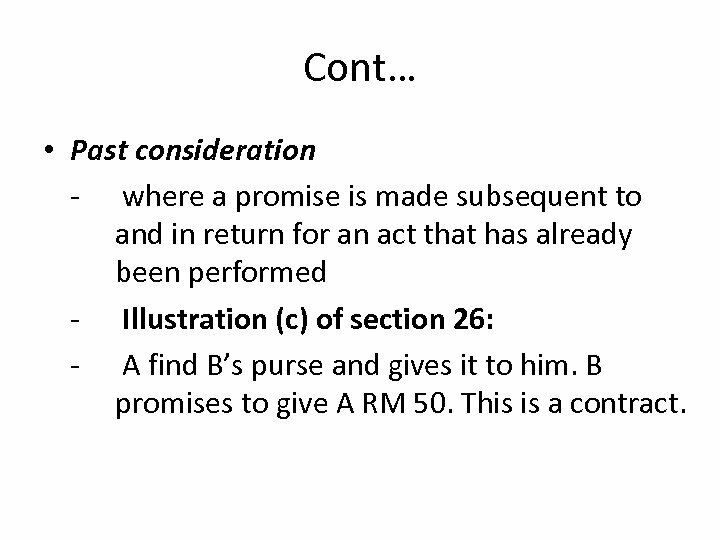 Cont… • Past consideration - where a promise is made subsequent to and in return for an act that has already been performed - Illustration (c) of section 26: - A find B’s purse and gives it to him. B promises to give A RM 50. This is a contract. 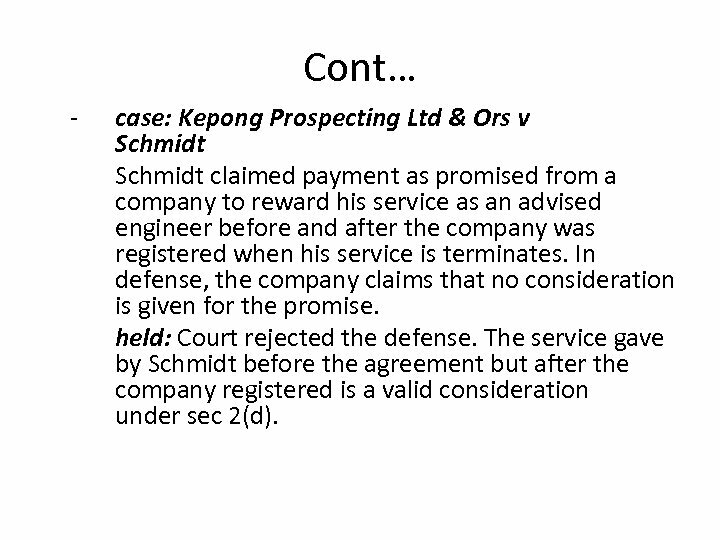 Cont… - case: Kepong Prospecting Ltd & Ors v Schmidt claimed payment as promised from a company to reward his service as an advised engineer before and after the company was registered when his service is terminates. In defense, the company claims that no consideration is given for the promise. held: Court rejected the defense. The service gave by Schmidt before the agreement but after the company registered is a valid consideration under sec 2(d). 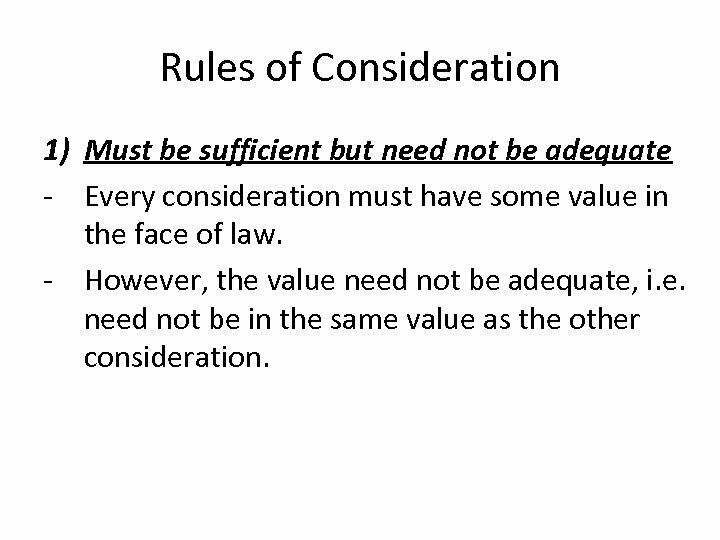 Rules of Consideration 1) Must be sufficient but need not be adequate - Every consideration must have some value in the face of law. - However, the value need not be adequate, i. e. need not be in the same value as the other consideration. 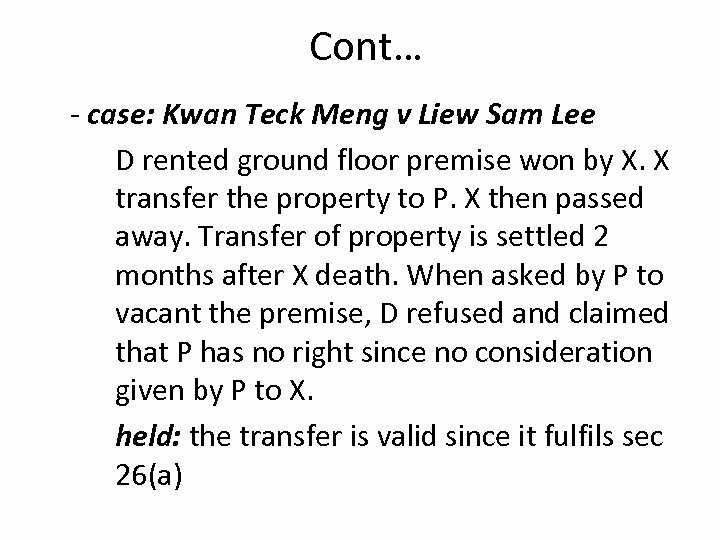 Cont… - case: Phang Swee Kim v Beh I Hock There was an oral agreement made between A and R in which R agreed to transfer the land to A on payment of $500. Upon payment of $500, A possessed the land. 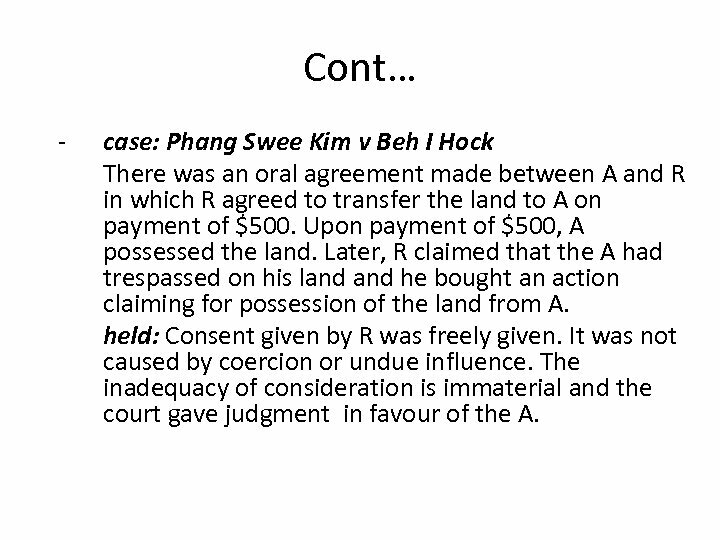 Later, R claimed that the A had trespassed on his land he bought an action claiming for possession of the land from A. held: Consent given by R was freely given. It was not caused by coercion or undue influence. The inadequacy of consideration is immaterial and the court gave judgment in favour of the A.
Cont… 2) Payment to compensate part of debt - Under S. 64: if A owes B RM 5000. C pays to B RM 1000 and B accepts them, in satisfaction of his claim on A. this payment is a discharge of the whole claim. 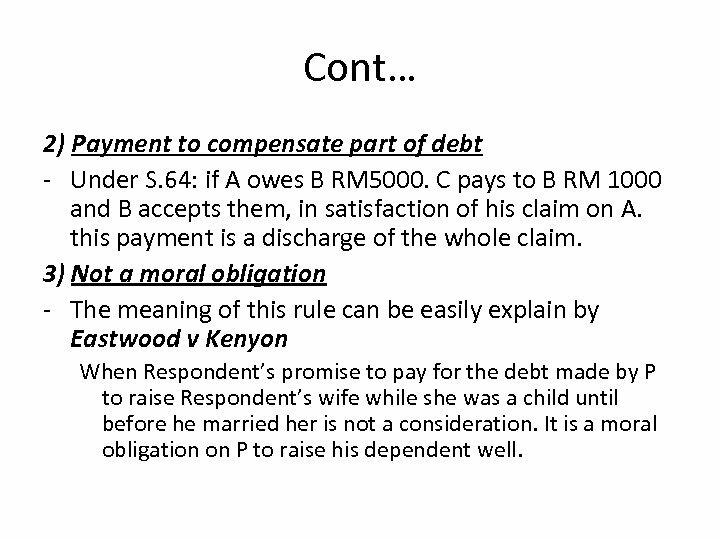 3) Not a moral obligation - The meaning of this rule can be easily explain by Eastwood v Kenyon When Respondent’s promise to pay for the debt made by P to raise Respondent’s wife while she was a child until before he married her is not a consideration. It is a moral obligation on P to raise his dependent well. Cont… 4) Not a public obligation - A person who is under duty to carry public obligation cannot claim his act as consideration to one’s promise. 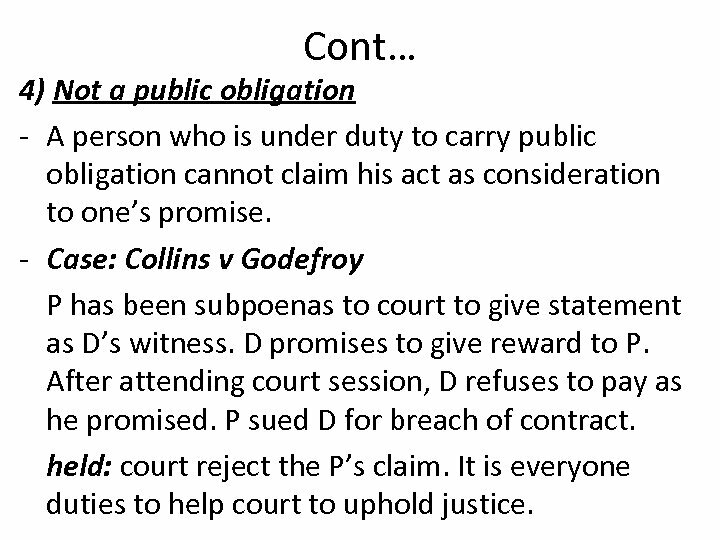 - Case: Collins v Godefroy P has been subpoenas to court to give statement as D’s witness. D promises to give reward to P. After attending court session, D refuses to pay as he promised. P sued D for breach of contract. held: court reject the P’s claim. It is everyone duties to help court to uphold justice. 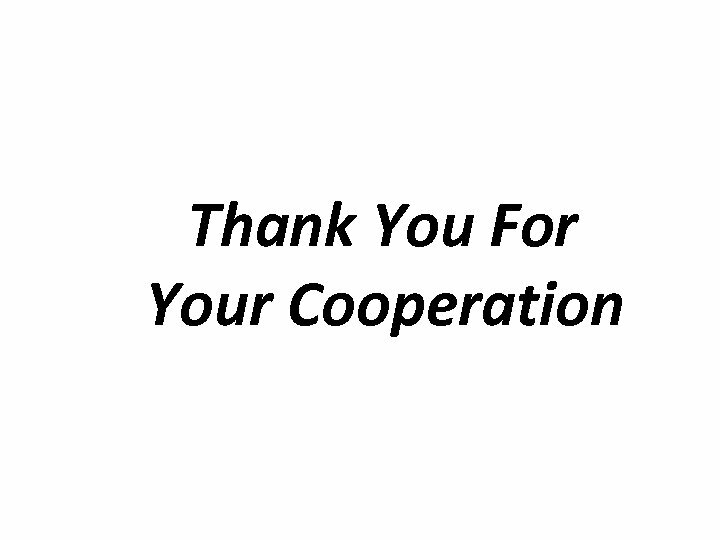 Cont… - however, if the obligation is more than necessary to public obligation, it can be a consideration to one’s promise. 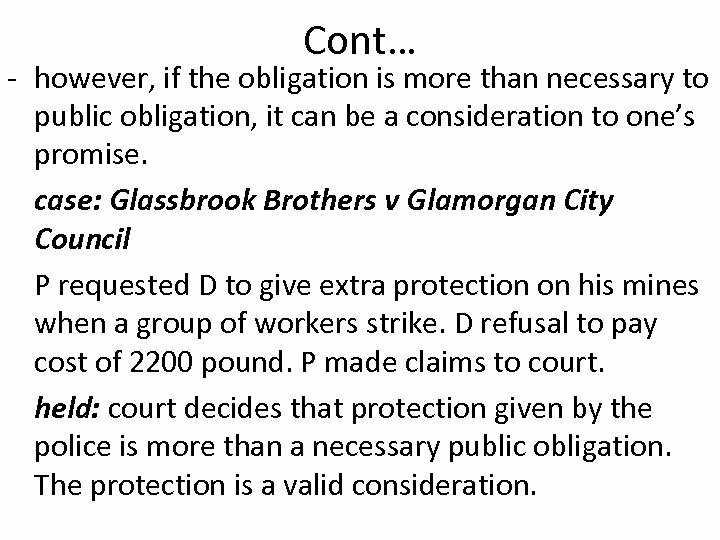 case: Glassbrook Brothers v Glamorgan City Council P requested D to give extra protection on his mines when a group of workers strike. D refusal to pay cost of 2200 pound. P made claims to court. held: court decides that protection given by the police is more than a necessary public obligation. The protection is a valid consideration. Cont… 5) Not a former obligation to the promisor - A party that already has an obligation to the promisor cannot claim that his action is a consideration to a new promise made by the promisor. 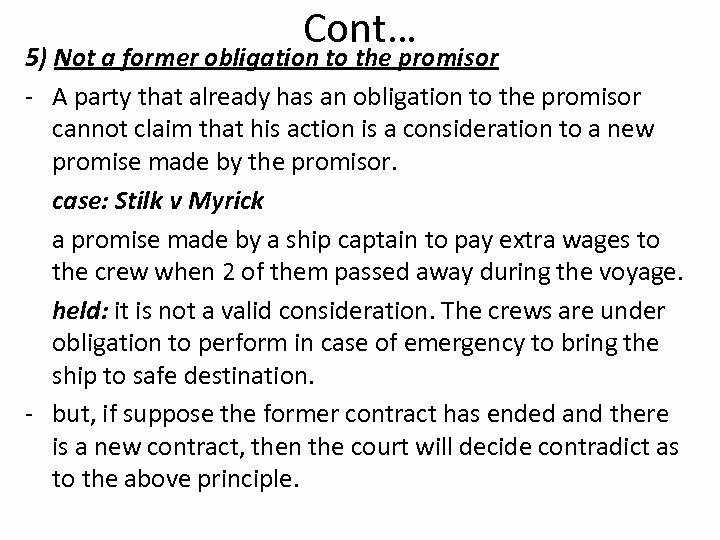 case: Stilk v Myrick a promise made by a ship captain to pay extra wages to the crew when 2 of them passed away during the voyage. held: it is not a valid consideration. The crews are under obligation to perform in case of emergency to bring the ship to safe destination. 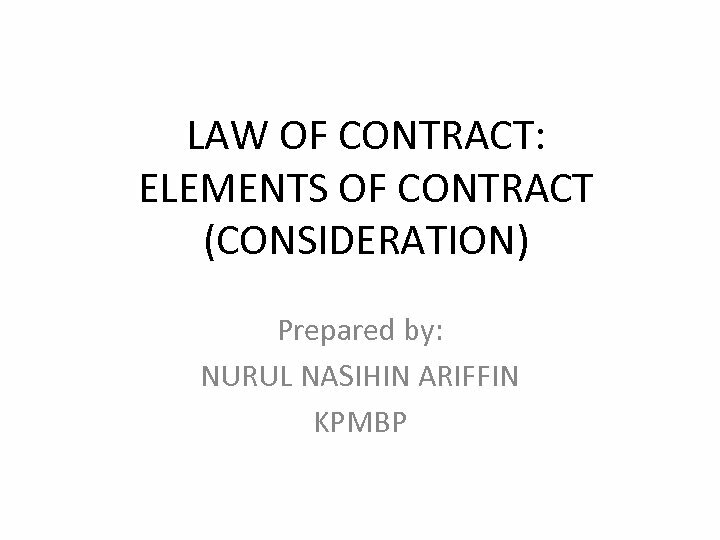 - but, if suppose the former contract has ended and there is a new contract, then the court will decide contradict as to the above principle. 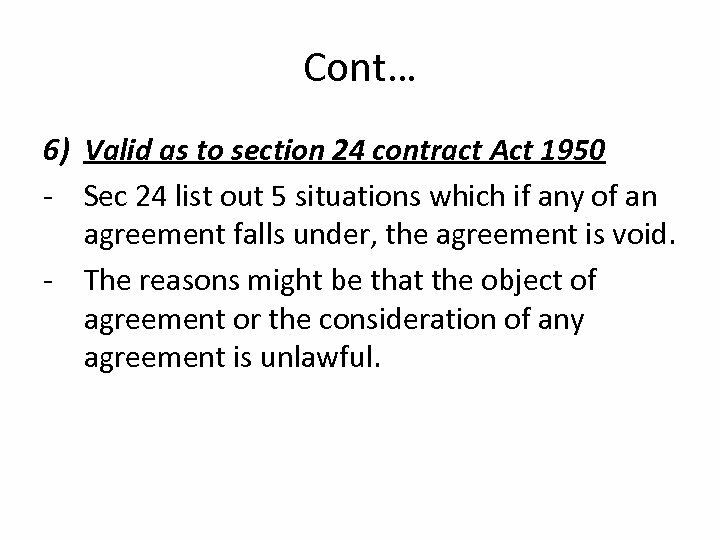 Cont… 6) Valid as to section 24 contract Act 1950 - Sec 24 list out 5 situations which if any of an agreement falls under, the agreement is void. - The reasons might be that the object of agreement or the consideration of any agreement is unlawful. Exceptions to consideration • In general rule, the law sets the rule without valid consideration from both parties, an agreement is void. 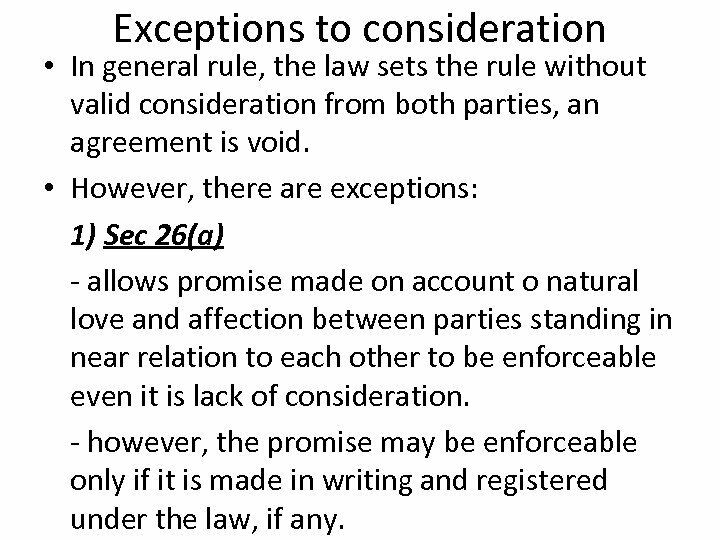 • However, there are exceptions: 1) Sec 26(a) - allows promise made on account o natural love and affection between parties standing in near relation to each other to be enforceable even it is lack of consideration. - however, the promise may be enforceable only if it is made in writing and registered under the law, if any. 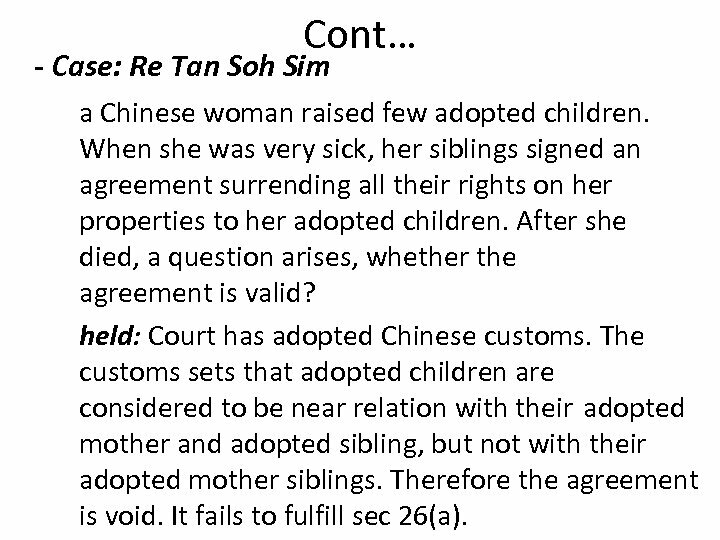 Cont… - Case: Re Tan Soh Sim a Chinese woman raised few adopted children. When she was very sick, her siblings signed an agreement surrending all their rights on her properties to her adopted children. After she died, a question arises, whether the agreement is valid? held: Court has adopted Chinese customs. The customs sets that adopted children are considered to be near relation with their adopted mother and adopted sibling, but not with their adopted mother siblings. Therefore the agreement is void. It fails to fulfill sec 26(a). 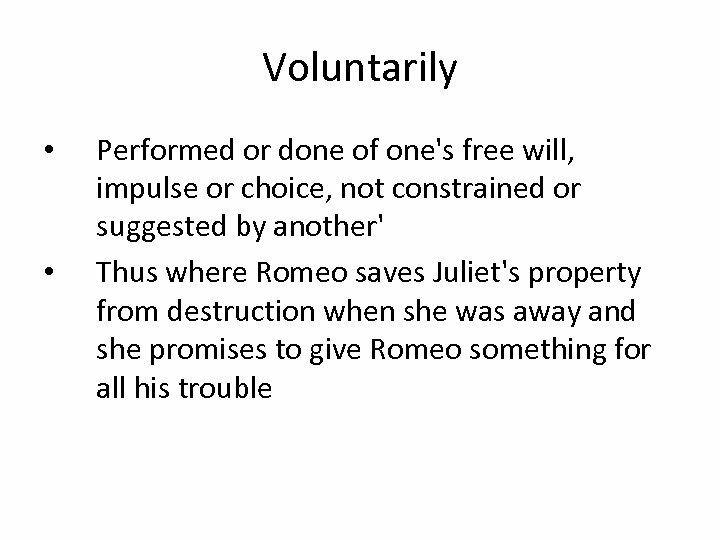 Cont… 2) Sec 2(b) - allows agreement without consideration to be valid if it is a promise to compensate for something done. 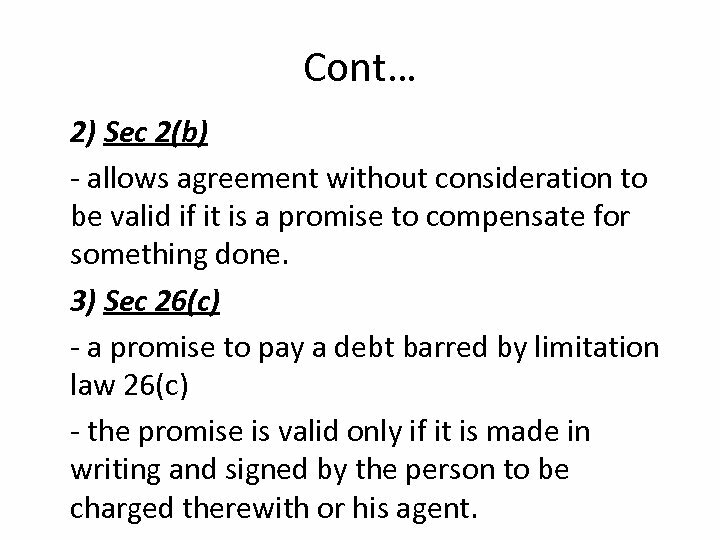 3) Sec 26(c) - a promise to pay a debt barred by limitation law 26(c) - the promise is valid only if it is made in writing and signed by the person to be charged therewith or his agent.